This holiday season, the Discovery Channel Store is offering toys that are fueled with hydrogen. Our family tested out the rocket ship, which is made by Estes Rockets. The Hydrogen Fuel Rocket is designed for children ages 10 and up (adult supervision required under 12), thus I had Eco Dad test it out. He also has more rocket experience than I. There are quite a few set up procedures for the first launch. Water is mixed with citric acid crystals to form the solution, which is good for 100’s of launches. This fuel solution needs to sit for at least 15 minutes for optimum rocket performance. Next, the launcher is assembled, including adding six “D” batteries and adding tap water to the fuel generator. Batteries are required, because the hydrogen is created though electrolysis. The electric current from the batteries is used to separate the hydrogen from the oxygen molecules in the water. The citric acid speeds up the process. During our first launch trials, the Hydrogen Fuel Rocket performed poorly. It only lifted a couple of inches and failed miserably at reaching the 200 feet promised. Eco Dad reviewed the directions to see if he had made an error, but there were no mistakes in assembly. We decided the toy was a dud, and left it for another day. The following day, Eco Dad decided there weren’t enough “bubbles” in the fuel generator, so he ran the fuel generation cycle twice. This time the rocket launched 100 feet in the air! After launching the rocket successfully over and over again, Eco Dad (like any kid would do) tried running the fuel generation cycle three times. He was determined to get the rocket to launch 200 feet, as promised on the box. Unfortunately, he hadn’t noticed that the small o-ring at the top of the launch tube had slipped off slightly. Instead of launching sky high, the Hydrogen Fuel Rocket blew a hole near the nose. We tried patching it with duct tape, but the rocket has never been the same. Now it won’t launch at all. It only took Eco Dad two days to break the Hydrogen Fuel Rocket, and as he said, he didn’t do anything that a kid would not do. When the rocket is going through the fuel generation cycle, it delivers facts to children about hydrogen fuel (click here to watch our home video of the fuel generation cycle). For example, children learn that hydrogen fuel does not contribute to global warming, and that is it is difficult to store. After we blew up the Hydrogen Fuel Rocket, I can see why we aren’t all driving around in hydrogen-fueled cars; however, if they can make toys that are powered by hydrogen, certainly this power source could be used more often. (Then again, I’m an artist and not a scientist, so I don’t know much about it). 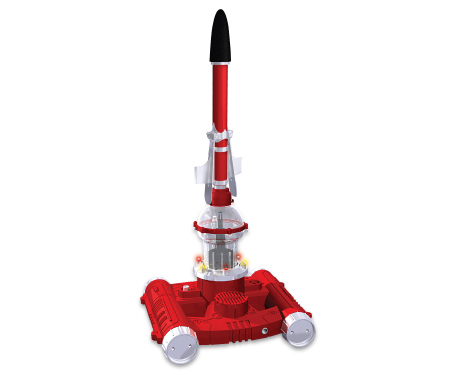 The concept of using alternative energy for toys has eco-appeal, but the Hydrogen Fuel Rocket gets low eco-merit marks for being made of plastic, using batteries, breaking quickly, and being made in China. Even though our play with this toy only lasted two days (we can order replacement parts), I think toy developers should consider alternative energy for powering toys. My kids were certainly fascinated with the Hydrogen Fuel Rocket. To read more about “green” toys from the Discovery Channel Store, click here. For more information on eco-toys, visit The Green Guide’s amazing chart on toys. i would like to know where i can get replacement parts. I have the same rocket . I have installed a better power source for the electrolysis , its still the same voltage but will last longer and is rechargable. i need a new rocket and some citric acid with quantity amounts for generator.